We at cXnX are actually taking credit for this week's sighting as the letter originally presented to us ﻿was a suggestion for our old Saturday Caturday features (before the inevitable humor crash of April) which had been lost and buried under a stack of [aherm] legal papers that we were burning over the weekend. We noticed this one and were charmed by the rather dimwitted presentation. ﻿I love your Caturdays. I first saw it when I was visiting my nephew. He had your website, http://www.construxnunchux.com/ up on the computer and I asked what it was. He said, "This site's usually alright, but Saturday Cats is a nosegay of lame." 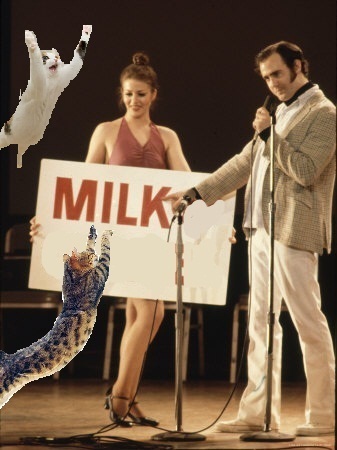 You shold do one about cat trainers. I have two cats, named after my favorite food and the sound it makes when I eat it. They have been with me for a total of 15 years. I had been searching through the phone book for a good cat beharvior specialist but in a town as small as mine, I'm the only one who cares about cats or any animals and we're lucky that the strays aren't run over every day. Squish had been acting funny lately and I did some reading at the library and found out that he had come down with Feline Schiophrenia. It became apparent that I was going to need a specialist. This was back in 1995 and it took over a year before anybody would be able to help me. 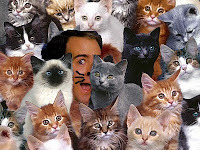 I think this man would be perfect for you to follow for a Caturday Saturday. His name is Chadhunt Sparkleballs and he specializes in "cat assimilatory regulation and associate fronts" or that's what his business card says. That's how I found out about him. I saw his business card in my screen door one day. It had been cut to fit the card in it. The card had no number or address, but said, "If you want me, be outside at midnight." I was. Chad came out from behind a set of trash cans at the corner and sniffed around the alley. Eventually he snuk up behind me and scared me. I didn't know it was him until he introduced him self. I handed him the business card and invited him inside. He handed me a video of his technique while he went into the kitchen for some juice and sandwiches. He had a banana, too. When the video finished, he smacked the remote out of my hand. "The important thing here is not to panic," "Andy" assures the viewer in his 2 minute instructional video. ﻿I told him my problem and he listened intently. I asked him how his business worked and his rates but he slapped the remote out of my hand again. He knew immediately where to find Squish and went immediately to his hiding spot in the hutch in the dining room. He scooped up Squich (sometimes I call him Mr Squish) and started talking to him in a very low voice. He turned to me and said they'd need a few hours and told me to leave the house. Then he threw the remote at me. Squish [top left] and Pretzel Log [right, standing... oh wait, sorry, bottom left, clawing the sign] demonstrating some behavioral techniques in the Twin Cities as part of the Chadhunt Sparkleballs Pan-American lecture series. ﻿A year later Squish and Pretzel Log were sitting at my front door. Squish smoked and Pretz had learned how to make a "tsk"ing noise, which he did constantly. I am allergic to cigarette smoke and I was tired of constantly being judged, so I had them both put down. Thanks again and keep the cats coming! An unaired scene from Andy's TV Special. Okay, so, yes, this, letter, is, a, little, weird. We weren't sure if this was a hoax (maybe by Andy himself) or if this lady was outta 'er gourd, y'know, so we looked into it, because we were damn sure from the photos she submitted that that was Andy! 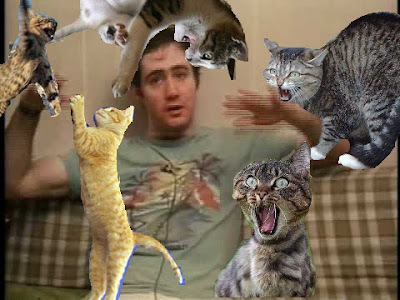 Turns out that early on in his career, Andy did not hate cats. He even began training as a feline hypnotherapist, apparently. 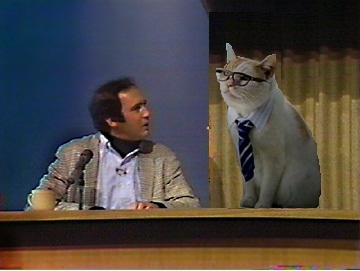 We kept interviewing and rummaging through our limited resources and found out that his ABC comedy special originally included an interview with his one time mentor in the field, Gato Pusspusssan. We "found" (legally, heh) one still from the cut scene. 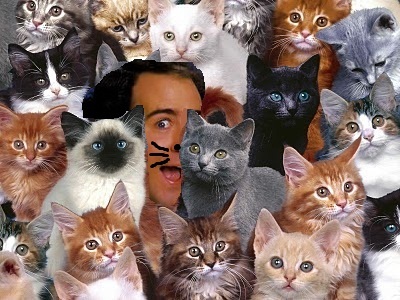 So Andy at one point or another did work with cats.